The constellation Aries. Roll mouse over to see labels. Aries is a medium-sized zodiacal constellation which represents a ram in classical mythology. 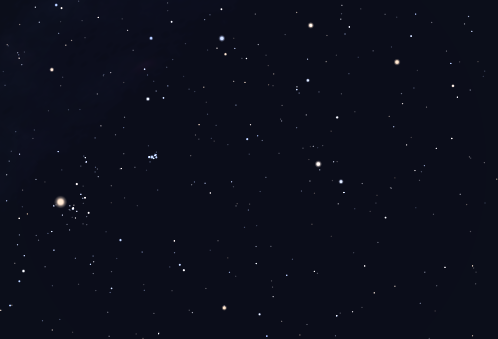 It is visible in the northern sky in the months around October, and is dominated by the two second-magnitude stars Hamal and β-Ari. These mark the two horns of the ram. Aries lies well away from the plane of the Milky Way and does not contain any open or globular clusters. It is home to many faint galaxies, though. In Greek mythology, Aries is identified as the winged ram whose golden fleece was the object of the voyage of Jason and the Argonauts. This constellation gives its name to the point in the sky where the Sun crosses the equator at the March equinox, known as the First Point of Aries. Historically, the Sun once lay in the constellation of Aries at the time of the equinox, but the phenomenon of the precession of the equinoxes means that it now lies nearly 30° away, in Pisces. 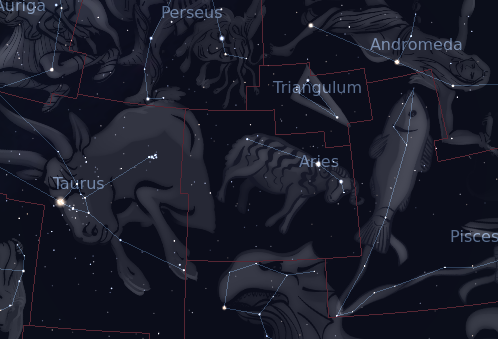 The following constellations neighbor Aries: Cetus, Perseus, Pisces, Taurus, Triangulum.